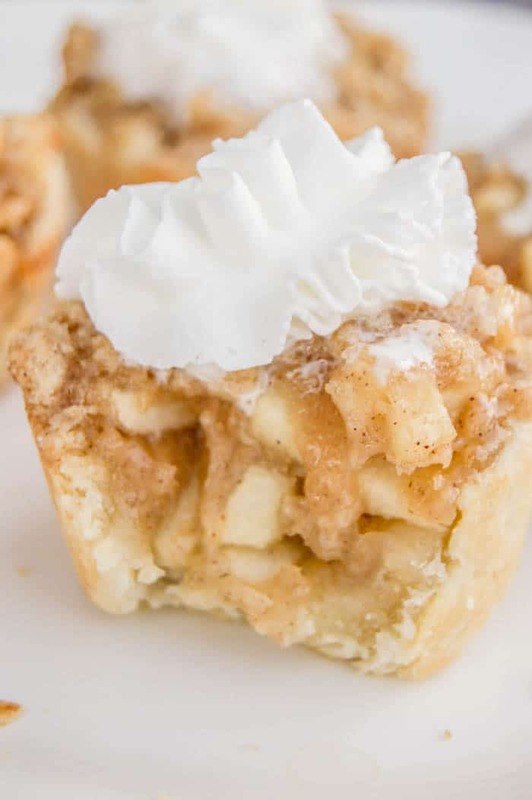 These adorable little Mini Muffin Tin Apple Pies are perfect for Thanksgiving or a midnight snack 😉 I love serving mini or bite size food. 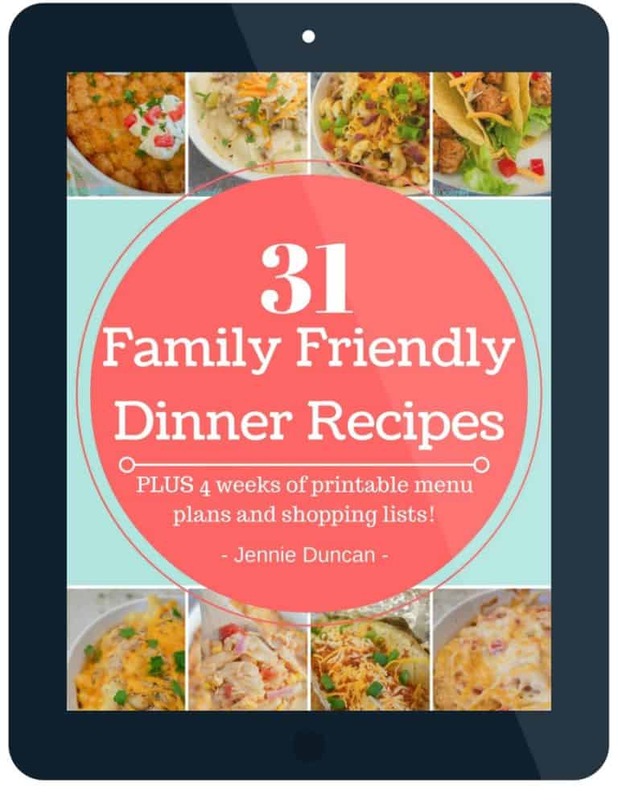 Not only is it adorable but it makes feeding guest so simple. No worrying about slicing, serving, topping. 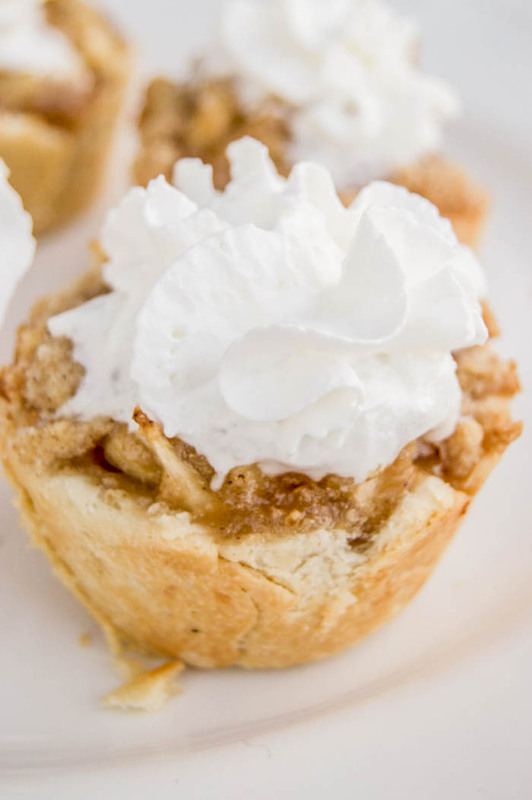 Pile all of these on a pie stand with a side of whipped cream and everyone can pick up their own mini pie. 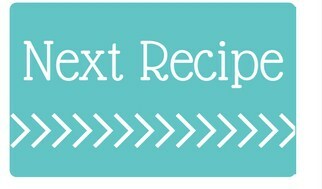 For this recipe you want to use a flour pie crust. You can use a store bought crust (each box comes with two crust and we will be using both) or make you own. 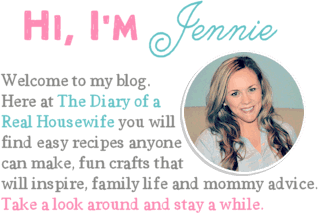 I have a really simple recipe that you can try, Homemade Pie Crust. What is the best kind of apple for apple pie? Making pie filling is actually pretty simple. You just need to place all ingredients in a mixing bowl and mix until apples are coated. Spoon in filing into each mini pie. 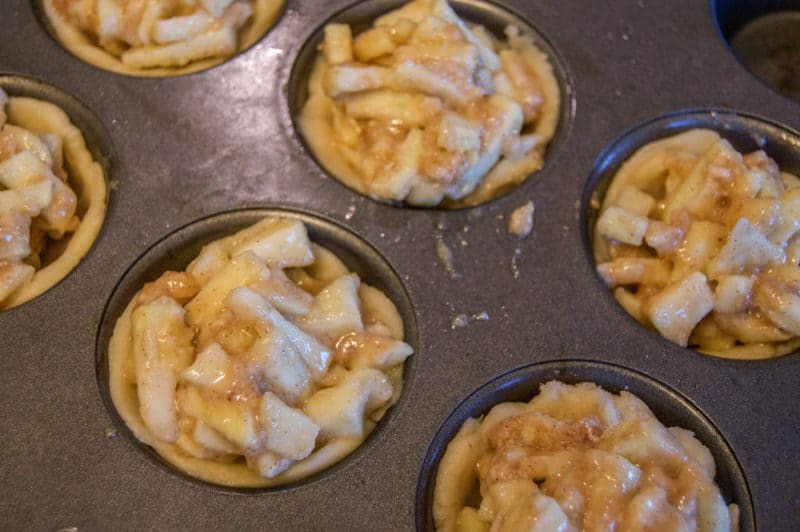 Since these pies are so small make sure you are dicing the apples very small as well. Use a fork to combine all ingredients until the mixture is well combined and crumbly. Once it’s crumbling and you have no dry pieces it’s ready! 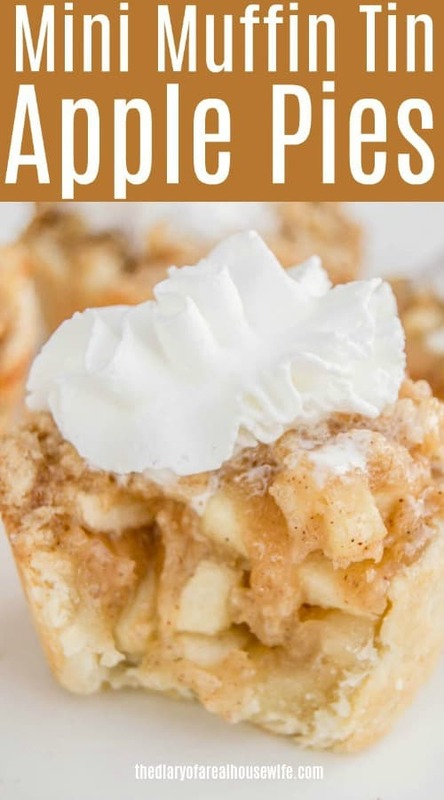 Dutch Apple Pie: This one is a readers favorite and a must try! Apple Pie Bar: This Dutch Apple Pie Bread had diced apples folded un and topped with a buttery crumble then baked. 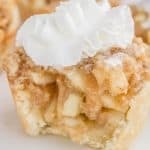 Dutch Apple Pie Bars: These Dutch Apple Pie Bars are made with a simple crust and filled with apple pie filling then topped off with a crumble. Make pie crust or use store bought and separate into 24 sections. You can just pinch and break off from a homemade dough ball or use a small round cookie cutter for a store bought crust. Roll our each sections and place a section into each mini muffin tin spot. 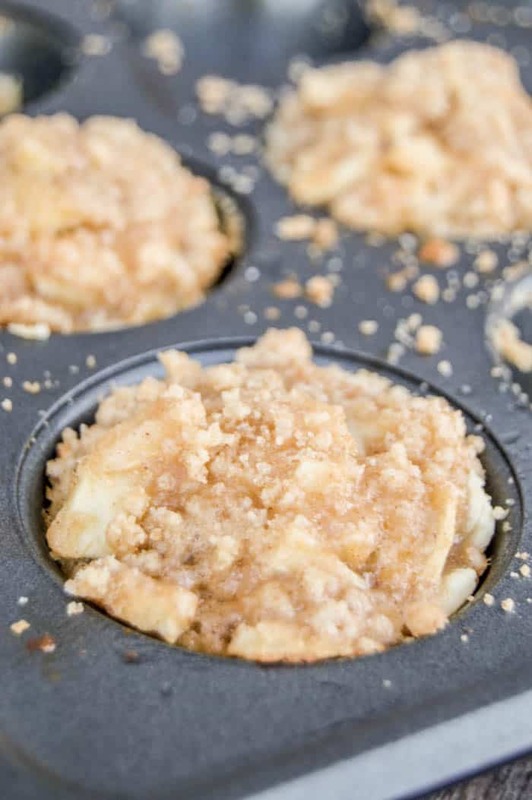 Use fingers to press down and around to fill the muffin tin. In a mixing bowl all all filling ingredients and mix until apples are coated. Spoon in filing into each mini pie. In a separate mixing bowl use a fork to combine all ingredients until the mixture is well combined and crumbly. Sprinkle onto each mini pie. BAke for 15-18 minutes until pies are cooked though. Allow to cool completely in pan about 30 minutes.